Facing the worst drought in half a century, Ethiopia had managed to avert a crisis without significant foreign aid, boasted a December 27th report on state-run news agency ENA. A day later Eshetu Homa Keno, a U.S.-based online activist, posted on Facebook a figure released by the United Nations showing that the amount of foreign humanitarian aid Ethiopia received in 2016 was more than a billion U.S. dollars while the government’s share was a relatively meager 109 million dollars. In another post on the same day, Eshetu raised a curious case of a stadium construction project in southwestern Ethiopia. The stadium, initially reported by state media to be finished in two years, was in its eighth year of construction without completion. Earlier that year the ENA told the public that most of the project was completed. However, the image it used in its report to illustrate the progress of the construction was uncovered by Eshetu to have been snatched from a Russian website. Public ridicule followed, forcing the news agency to take the picture down. Eshetu is among a new breed of online activists working to hold state news agencies in Ethiopia accountable – a task that has grown more important as independent media wither. He has been active on social media for more than eight years but it was only a couple of years ago that he decided to focus on what he calls “exposing the outlandish lies and exaggerated development reports” by state-owned and affiliated-media in Ethiopia. Close monitoring has raised interesting questions about seemingly bland and straightforward state news items. 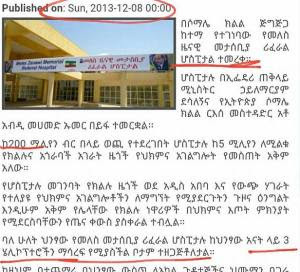 For instance, Eshetu pointed out last month that a new ENA report on the opening of a hospital in the town of Jigjiga contradicted reports carried earlier by other state-affiliated agencies, Walta and FanaBC, which pointed to an earlier opening date. The underlying inconsistency of these reports raises questions about why the hospital project opened behind schedule, whether there were also cost overruns, and other performance issues not addressed by the state media reports themselves. Online activism in Ethiopia is also trying to fill a gap left by a lack of vibrant civil society. An online project, Ethio-Trial Tracker, hopes to bring light to the government’s “use and abuse of anti-terrorism proclamation,” by documenting people charged under it. Ethiopia is ranked as one of the top five worst jailers of journalists worldwide, second only to neighboring Eritrea in sub-Saharan Africa, with 16 journalists imprisoned currently, according to the Committee to Protect Journalists. A 2015 report by human rights watchdog Freedom House claimed that the government employed a variety of strategies to weaken the independence of the press, including legal pressure, censorship of newspapers and the internet, arbitrary detention and intimidation of journalists and bloggers, and heavy taxation on the publishing process. 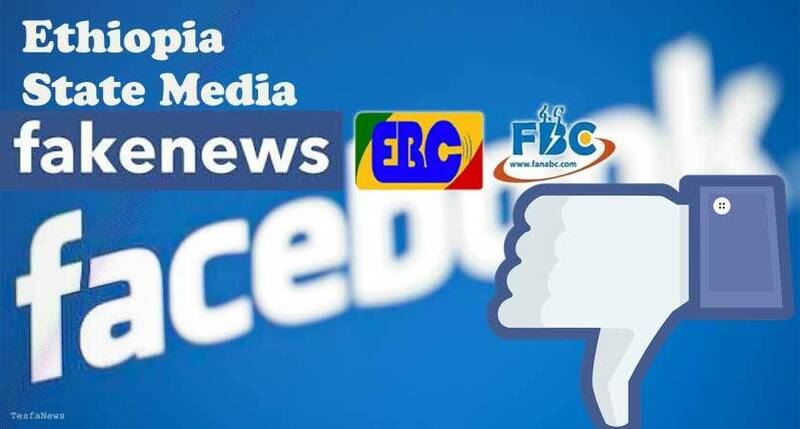 According to a journalism and communications lecturer at Addis Ababa University, the weakness of the independent media coupled with the government’s tight grip on information creates a fertile ground for fictitious reports to flourish. Speaking at United Nations General Assembly summit in September, Prime Minister Hailemariam Desalegn warned world leaders about the dangers of social media. “Social media has certainly empowered populists and other extremists to exploit people’s genuine concerns and spread their message of hate and bigotry without any inhibition,” he said. A couple of weeks later he declared a state of emergency as a response to a yearlong wave of unrest and shut down certain social media platforms including Facebook, Twitter, Viber and WhatsUp, in various parts of the country. One of the early victims of the state of emergency was the Addis Standard, a monthly magazine critical of the government which was forced to stop its print edition in November. Its editor in chief, Tsedale Lemma argues that social media has become a den for extremists but also presents great opportunities for journalists to highlight unreported issues and offer alternative perspectives. “It is easier for the Ethiopian media, with its limited capacity, to get stories breaking on social media and follow the lead for further verification when that’s possible,” she says. The editor cites the example of the anti-government protests that started in November 2015 in Ethiopia’s largest state Oromiya. The government believes that the protests may have been orchestrated from abroad – or at least hijacked by foreign-based activists. In February charges were made against a prominent social media activist based in the U.S., Jawar Mohammed, for his alleged involvement in the protests. For Eshetu, though, “the protests were the result of a continuous abuse of power by the ruling party which left the country’s youth disillusioned and hopeless.” Yet social media gave it some energy, he says. Four months into the state of emergency, the government has shown no sign of loosening its grip on the media or civil society. But authorities reopened access to Facebook in Addis Ababa in December – a boon for Ethiopian online activism. With Facebook as their preferred medium, online activists like Eshetu might succeed in eventually eroding popular trust in state-run media. But also possible is that they will spur reforms that will make state outlets more professionalized and responsive. What’s clear is that state media and social media – and not independent media institutions – are the two dominant publishing sectors at the moment and they are likely to continue in uneasy coexistence for some time to come.